A new study published in the International Journal of Molecular Sciences has demonstrated the potential of multi-lipid profiling to support future biomarker development for Chronic Obstructive Pulmonary Disease (COPD).1 Combining lipidomic profiling with computational network biology analyses, researchers were able to build a comprehensive and quantitative picture of the lipidome that is capable of distinguishing cigarette smokers from non-smokers, with improved separation of smokers that were symptomatic of mild to moderate COPD. The study was designed to identify a biomarker, or panel of biomarkers, suitable for the differentiation of four groups: smokers with mild to moderate COPD, healthy smokers, individuals who have never smoked, and individuals who have quit smoking for a year or more. Males and females between the ages of 41 and 70 years took part. 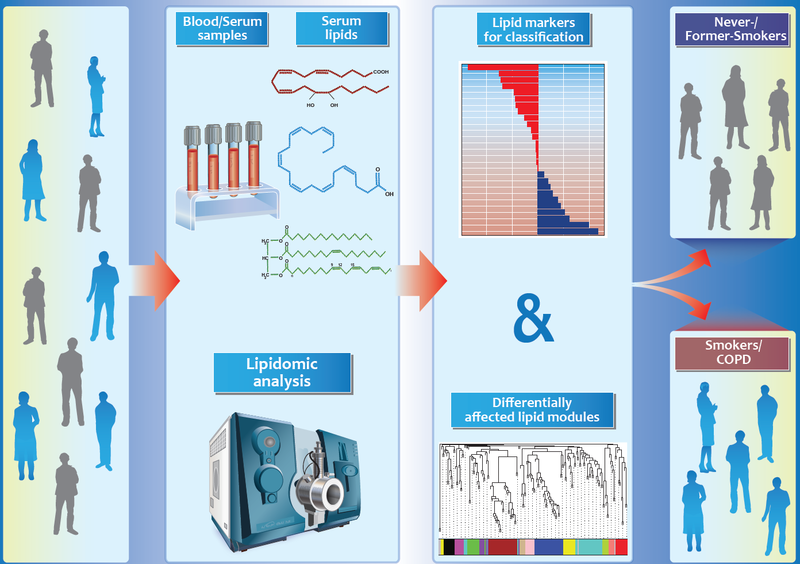 A combination of four mass spectrometry based platforms were used for the purpose of lipidome analysis, monitoring a total of 26 different lipid classes. The approach allowed for the detection and quantification of diverse lipids over a wide concentration range. Leveraging a network biology analysis approach, the authors identified three main lipidomic trends between smokers and non-smokers: a general increase in glycerophospholipids (the main component of all biological membranes, e.g. cell membranes), changes in fatty acid desaturation (a decrease in poly-unsaturated fatty acids, an increase in mono-unsaturated fatty acids), and an imbalance in eicosanoids (signaling molecules that exert complex control over many bodily systems). These effects often appeared amplified and more significant in the group of smokers with COPD in comparison to the group of smokers without COPD. However, the COPD group was also associated with a higher cumulative smoking exposure than the healthy smoking group, so it remains unclear which effects are more closely linked to COPD, rather than being the results of more extensive cigarette smoke exposure. This suggests that the future study of former smokers with COPD may help to identify effects that are more specifically related to COPD itself, rather than cigarette smoking.